ACM Honors is to take place at Nashville's Ryman Auditorium on Wednesday, August 22, 2018. Tickets are available here and at the Ryman box office. The Academy of Country Music® has revealed the first round of performers and presenters for the 12th ANNUAL ACM HONORS™, an evening dedicated to recognizing the special honorees and off-camera category winners from the 53rd Academy of Country Music Awards™. Artists confirmed to perform include Lauren Alaina, Kassi Ashton, Cam, Deana Carter, Morgan Evans, Dustin Lynch, Ashley McBryde, Old Crow Medicine Show, Jon Pardi and songwriters Dallas Davidson & Ben Hayslip. Presenters include Jordan Davis, Lindsay Ell, Lori McKenna and Storme Warren. ACM Honors will take place on Wednesday, August 22, 2018 at the historic Ryman Auditorium in Nashville, TN and will be co-hosted by Lauren Alaina and Jon Pardi. Tickets are available to the public at Ticketmaster.com. 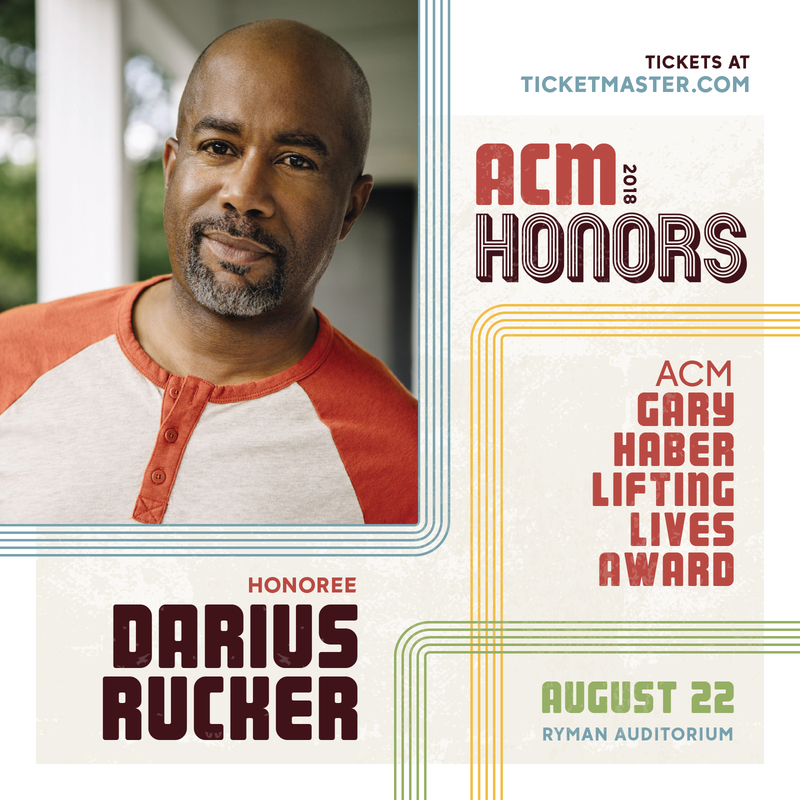 As previously announced, Darius will be receiving the ACM Gary Haber Lifting Lives Award. Other special award recipients to be celebrated at the 12th Annual ACM Honors include Dierks Bentley (ACM Merle Haggard Spirit Award), Matraca Berg (ACM Poet’s Award), Sam Hunt (ACM Gene Weed Milestone Award), Alan Jackson (ACM Cliffie Stone Icon Award), Mickey & Chris Christensen and Eddie Miller (ACM Mae Boren Axton Service Award, all awarded posthumously), Rob Potts (ACM Jim Reeves International Award, awarded posthumously), and Norro Wilson (ACM Poet’s Award, awarded posthumously). The evening will also honor winners of the Industry and Studio Recording Awards, along with Songwriter of the Year Award winner, Rhett Akins. Tickets are available here and at the Ryman box office.